Take out a piece of paper, and write down what you think makes your company different from its competitors. Now, Google your competitors and see if you can tell the difference between what you wrote, and how they describe themselves. If it sounds the same, keep reading. Let’s say you’re the CEO of a fortune 500 company looking for some advice. 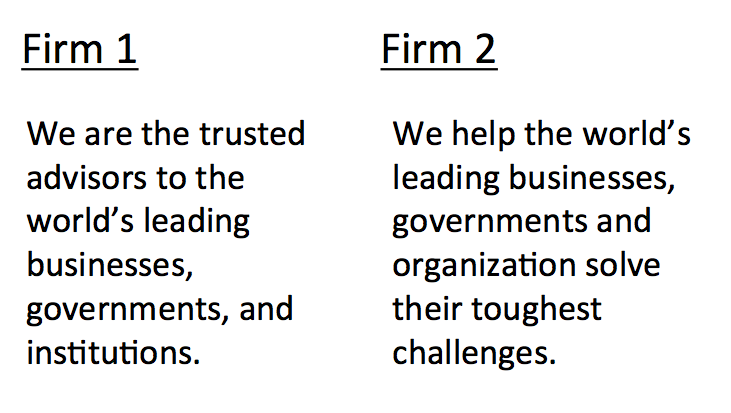 Two top tier global consulting firms are recommended, and based on their website descriptions of “Who They Are” which one would you chose? Can’t decide? That’s the challenge I’m talking about. Although one firm uses “advisors”, they are describing what the firms do, not who they are, and as you can see, the sound the same. If some of the smartest guys in the business are getting it wrong, and they’re the “advisors to the world’s leading businesses” you shouldn’t feel bad. Why is it so hard? There are two key reasons; the first being in B2B, we are conditioned to think that what we do is who we are. It’s the Achilles heel of effective marketing communications, the bad habit of over communicating and focusing what you sell (what you do) versus who you are (what makes you different). Making things worse is when B2B marketers talk about the value of what their company does, they use terms associated with business value, the functional benefit or business outcome of the product or service being sold (e.g. increase revenue, reduce cost, retain customers, etc.). It’s non-differentiating because competitors use the same language, and that’s the second major challenge to overcome. Over the years, marketing communication has evolved from talking about how great the company was to talking about what it does for customers. Thankfully the “we’re number 1” days are over but unfortunately, the “what we do for customers” has been defined by what the company sells. It is time to evolve again and speak to more about the “DNA” of the organization. Research from CEB has shown that buyers figure out what companies sell (what you do) relatively quickly. It takes them much longer to figure out why they should buy from one company or another. And surprisingly, when they do make the decision, it often has little to do with “business value” of the product or service itself, and more to do with the emotional connection they feel to it, or to your brand. Buyers are not the rational beings we once thought, they do business with businesses for very personal reason, according to the CEB research. As a result, they want to get to know the company as well as they know the product or service. Ask customers – sounds obvious, but rarely happens. Ask them why they do business with your organization and others. You might be surprised by what you’ll learn; it may have nothing to do with your products or services. Use this information to communicate back to them “who you are” in the language and context that is meaningful to them. Survey employees – this may help uncover why the organization can’t get on the same page when it comes to defining the company. Employees have a tendency to define the company and what it does, based on their own experience with the products they know, and customers they serve. As a result, they have a myopic view of the organization. You will find multiple views on your value, and the type of company you are, across your organization. Decide on the type of company you are – pick up a copy of Michael Treacy’s Discipline of Market Leaders. In it, Treacy and Fred Wiersema define three value proposition types based on business models; Operational Excellence, Product Leadership, and Customer Intimacy. Use this framework as a starting point to define your organization and its’ language. It also helps get everyone on the same page. Create a persona – once you have consensus on the type of organization and its value to customers, it is time to figure how to differentiate it. In this step, use brand archetypes to help define the company persona. Here’s a free list of 40 archetypes. Create a working session and have the group discuss how the company views the world, how it reacts to bad or good news, how it speaks — what is the tone? Keep the conversation away from what the company makes or does, and on the organization itself. Buyers have changed. They want to know who you are, because they already know what you do. And they’re looking for a little of themselves in your brand. Relate to them on a human level. Tell them who you are in a way that connects with them. If you do, it will differentiated you, because like people, no two organizations are exactly alike. Last week I had the pleasure…to my surprise…of hearing my 6th grader work the phone selling Girl Scout cookies. She’s been a Girl Scout for a number of years and has achieved “Cookie Diva” (Cookie VIP this year) status numerous times by selling more than 150 boxes of cookies. Although I had helped her over the years by selling some cookies at work, I never actually got to hear her sales pitch, until last night.Sure, it’s hard to resist a Girl Scout selling cookies, but as a sales and marketing consultant for the last 12 years, I was struck by how well a simple, honest approach to selling worked. It was an interesting and enlightening 30 minutes. Niceties/Pleasantries – started every conversation with “happy new year”, and talked about their holiday, children, etc. She invested the time in catching up with them even though she had limited time to make calls between homework and bedtime. She didn’t jump to “getting the order.” It made me think about how often I rush through this important step because of time constraints, pressure on revenues, and/or proposals. If customers think that the only time you call them is when you want something…this certainly confirms it. Customer Knowledge – no sophisticated databases, profiling or scripts. She did her homework by knowing what they ordered last year, what girls were no longer Girl Scouts, etc. which made it easy for customers to place orders because she knew them well. Product Knowledge – not only did she know all the cookies, including the new and classics, but also how many where in a box and how they were packaged. The best part was describing how to consume them…see above. I can’t tell you how many marketers I’ve worked over the years that don’t know the products their companies sell. I’m convinced that this lack of product knowledge is the leading reason why sales organizations dismiss or don’t respect marketing/marketers. Want to improve sales and marketing integration, train your marketers on products and see what happens. Reference/Customer Testimonies – when her personal testimonials weren’t getting the job done she started to talk about others in the family and/or someone they knew. It made me think, do customers really care to hear reps experience with their own products? Maybe not, but do they listen to how convincingly or passionately they’ll testify…you bet! Customer testimonies are always the best –the more relevant the situation the better, but they also judge reps consciously or unconsciously on how well reps make their case (see the bullet above). Handling Objections & the True Decision Maker – she went after a new customer who told her that they usually buy from a girl in the neighborhood. She then asked for the lady of the house recognizing the dad/husband was not the real decision maker (home schooled on this trick). She got an order but not the full order…the girl in the neighborhood will still get hers…but it will be a couple of boxes short.How often do our reps stop at “no” or get stuck dealing with the first contact vs the real decision maker? We all know that we’ll have to work harder to get the order than in the past, maybe we don’t go for the home runs as often, and settle for few singles instead. Incentives – simple and straight forward, no complicated % or calculations…sell this much…get this. A compensations consultant’s dream, straight forward and easy to implement. On the order sheet, it lists the prize the girls receive based on their sales. As she reached certain level (25 boxes, 50 boxes, etc) she would tell us what prize she was won and what she was going for next. But the big one, the President Club, the one that screams “I’m the Diva” was the Cookie VIP patch.Good old fashion recognition for a job well done that lasts all year. Oh, how we’ve complicated incentives plans over the years. The search for the ultimate motivator has many times led us down the wrong path. Is it time to simplify, not sure, but I would bet it’s worth investigating. Connecting it to Social Causes – this is the primary fundraising vehicle for the Girl Scouts and people know it. Can you write off the $3.50 per box as a donation? No, but you do feel good about placing you order, sure. We’re all so socially aware nowadays, are there opportunities to connect your products to the “greater good?” You may have seen the latest ads from IBM and how they’re products and services can help companies “go green.” It’s time to add this to the value proposition…or at least consider it. Yes, I know that many of us have much more complicated sales processes and products/services, but how much of that is self inflicted? At the end of the day, don’t all customers want the same thing…a good product or service that satisfies a need/want representing good value acquired through a pleasant experience? During this difficult economic environment, listening to my daughter was a good reminder of how well having a good product, knowing your customers and believing in the value that you’re providing can work. Is it time to simplify our products, value proposition, how we compensate our reps? It may depend on the company, the situation, the market…but I would bet it wouldn’t hurt. At the end of the night, ten phone calls, 10 closes and over 70 boxes of cookies sold in the matter of 30 minutes (pleasantries, product description, and an order every 3 minutes). Not bad for a junior telemarketer with no training. The GS’s will sell over 200 million boxes of cookies over the next month…more than any cookie manufacturer will sell in the entire year. Does simple work…for some, extremely well. The question is, can it work for you? Given our average deal size we used to think we needed to have a scaled down offer to get a foot in the door. Once in, we could then grow the account. We were wrong. Considering the current economic situation, I know that many companies may be tempted to come up with a “door opener.” A subscale and/or entry level product/service intended to get a foot in the door with a new client and/or a new business division. You’re also probably thinking about going down market into smaller accounts. Although this shift may help satisfy short term revenue needs it will do little to nothing in helping grow your business. Most likely those accounts will not expand and/or even be retained next year. Here’s how I know. Looking back at the new accounts acquired over the last four years we found some interesting trends and confirmed some things that we knew intuitively (click on the image). When we measured the value of customers in their first year against the average time spent engaged with the client a few key insights emerged. Customers who represented under $250K in total billings from the year. Let’s start with the bottom and work our way up. Customers in cluster 3 had an average value of $150K. Accounts on the lowest end of the spectrum in the “One and Done” zone” (under $10K for example) were “workshop”…our “foot in the door” offer. Guess what, of the 8 that fit that description zero, zippy, nada, grew beyond the initial workshop. The other bad news…only 2 accounts led to follow on work and no company in that grouping was retained the following year. I was speaking with Larry Emond, CMO of the Gallup Organization the other day and he mentioned that they saw a similar trend; “We found that only 4% of customers who were acquired under a certain price point grew to be substantial customers.”On the other end of the spectrum are the occasional customers who are big right out of the gate. The “Rare Birds” zone in cluster 1 includes those few customers who start big and for the most part remain large customers YOY. The key to success with this cluster is that they had/have a tendency to have a need for multiple service lines and/or desire a complex solution. This group was looking for a strategic partner versus a vendor for an immediate need. Year over year retention was also good at over 50% and if they used multiple services lines it was almost a sure thing they be retained….and grow. As Larry also mentioned; “Our big customers today came in as big customers…”. We’ve had the same experience and have grown our top 5 largest accounts by an average of 90% over the last two years. Customers in cluster 2, the “Sweet Spot” represented the best of both worlds. Although their value was not as high as the “Rare Birds” they were more plentiful. They also had higher price points, high percent of follow on work and YOY retention than the “One & Dones.” Retention rates although not as high as the “Rare Birds” was good (a little over 33%). Bottom line – they represent the model that we need to build our coverage and services bundle against. We have also realigned our resources to help account development/retention activities against this group. Why do low price point and short engagement acquisitions perform so poorly? Length of the engagement – too short to learn business/issues/meet folks/create a relationship, etc. They get the “B” team – the “A” team is on existing accounts, as a professional services firm that measure FTE productivity this will always be the case. Short term need vs long term problem – we were successful in building a relationship with target buyers within targeted accounts. So much so that they decided to “give us a try.” The problem with that is that it was usually a piece of work that wasn’t strategic. Size matters – our win rate and retention rate dropped dramatically on companies that had under $1B in revenues. The only exceptions were situations we were able to sell a solution as the first engagement. Culture/Attitude – some companies just don’t have a culture of working with outsiders. This very difficult to know until you’re in the door. Retaining and expanding your biggest customers with new lines of business. Find your “sweetspot” based on this type of analysis…what is the right mix of services and price. Targeting big companies with big needs…there are many out there now just make sure you have the right offer. Because at the end of the first engagement…a foot in the door just isn’t enough. Wow, what a couple of weeks it’s been for the Financial Services industry. Investment Banks have disappeared, the government owns the world’s largest insurance company and Congress is debating whether taxpayers should foot the bill to get us out of the largest financial debacle since the great depression.So what might all this mean to sales and marketing folks in the industry? Our Financial Services practice and I have spent the last week and a half looking at the changes and have come up with a list of potential areas that may be impacted…negatively or positively. I’ve even gotten feedback from a colleague in Europe on what this might mean internationally. Keep in mind that the crisis is shifting everyday, so this is like trying to look over the horizon while standing in quick sand. Greater regulation across the industry will reduce the number of ‘innovative” products making it more challenging to differentiate by product. As a result, companies will need to increase the importance on competing through superior distribution, and having an unique segment aligned value proposition. A greater need for solution sellers vs product pushers – In this environment, sales channels with reps that can sell value will be essential.” Additionally, the need to sell new services “bundles” necessitates more sophisticated reps. Product Pushers” who sell on price will continue to erode already pressured margins. We may also see someone like Progressive uses their direct model to commoditize more products/services perhaps some low end products in the Commercial Insurance market. If you are an agency or broker, move up the value chain to selling sophisticated service solutions. Wholesalers and/or Aggegrators may help facilitate that shift. Relationships are still key but “best price” will continue to be the key consideration driver. A significant need to lower the cost to sell – Increased regulation most likely will add cost and/or impact margin. Companies will have to find a way to do more with less. They may also look to new lower cost channels to distribute products. Relationships + low cost, self service channels = success. Because solution sellers are hard to find and more expensive, there will be a focus on finding ways to create “leverage” for channels/reps. Customers will have greater leverage – Good customers will be in the driver’s seat. They will be more cautious, demand greater value and lengthen sales cycles. Profitable customers will be highly valued and targeted, see bullets 6,7, and 8. New risk models or new underwriters – There may be a need to rethink how companies evaluate, take on, sell and/or manage risk. This may also be impacted by new regulations. Improved segmentation & predictive modeling – Cost pressure and increased competition will force the need to improve targeting, increase yield of programs and campaigns, and get the most out of existing customers (increasing cross sell and upsell opportunities). Increase focus on retention and loyalty – Investment banks, now bank holding companies or a part of a Retail bank will now have to fund their activities on customer deposits rather than “funny money”. Look for them to come after your best customers. New competitors, “Super Banks” & consolidation – Look for the pace of consolidation to pick up with the recent changes. The banking landscape has changed with Goldman Sachs and Morgan Stanley becoming bank holding companies. This sets them up to either acquire banks themselves and/or merge or being acquired. Existing players, such as BofA and Barclays, are picking up the pieces that will help them expand services. Safety in geographical diversification–Major international banks will seek a more geographically diversified portfolio. Being active in U.S. and Europe is not sufficiently diversified to protect against the crisis, as UBS discovered. Those who were strong in China, India, and Brazil have faired better. For example, HSBC’s huge U.S. write-offs were counterbalanced by spectacular gains in their Asian operations, so their shares have stayed stable. Santander, a European bank, has faired well due to its involvement in Brazil, and is now buying up businesses from cash-strapped competitors, e.g Royal Bank of Scotland. Some of the bigger banks will seek to copy HSBC and Santander – most do not have sufficient reach, and are more likely to merge with a domestic competitor. Domestic mergers lead to channel rationalization headaches. More domestic banking mergers mean more headaches around how to combine two different sets of distribution channels. These are tough decisions. Huge investment has been sunk into branch networks, a regulated sales forces, broker networks and brands. Exit costs are very high. Banks need a rational basis on which to base their channel rationalization decisions. You’ve killed your partner channel. What do you do now? Over the past 10 years many of the reputable agents and intermediaries have come to rely more and more on cheap credit deals for their income. When the banks stopped lending they were the first to go bust – not just the charlatans and quacks, but some good people who will not now come back to the market in a hurry. When the bank is ready to expand again, how do they rebuild the partner channel? Look again at Buy vs. Build. Mergers also present dilemmas for product portfolio managers. There are make or buy decisions for different product categories– e.g. should a bank sell its own general insurance? Difficult to know what will happen here. Will the drive for more transparency in investment products actually extend into all FS products? Remember when you had a unique product, a top-notch sales force, customers who couldn’t get enough of your product and were willing to pay anything for it. Sales reps couldn’t close deals fast enough and the factory couldn’t keep pace with the orders. Little to no inventory cost, high margins, an incredibly productive sales force, big bonuses, soaring stock, etc…things couldn’t be better. But what happens when demand begins to slip? One of the first things to occur is that your best customers, who in the past had no leverage, begin to feel the advantage shift their way and sales reps (unknowingly and for the most part unwillingly) help that transition. As demand cools, good sales reps who are trained negotiators and born manipulators, begin turning their finely tuned sales skills on the organization. Feeling the pressure to close business and meet quota, reps begin “selling” the organization on what they need in order to get the deal done. Instead of driving customers into existing solutions with a premium price, they take the course of least resistance, demanding that the organization bend to meet the customer’s (not the company’s) requirements. The company “customization” party goes on for as long as the sales quotas exceed market demand for the product. Large contract departments – When demand is high, customers typically agree to standard terms and conditions in order to get the product as quickly as possible. As demand slows customers begin to try to gain leverage by modifying the “T’s & C’s” of a contract to their advantage. Reps desperate to get the deal signed before the end of the quarter apply pressure to the legal and contract departments to accept customer terms. This results in contracts so complex to manage, that additional staff is needed to administer them. In one hi-tech firm, for example, it takes a staff of four to perform administrative tasks related to just one large customer contract. Multiply that by twenty large customers and you begin to see the problem. A Service Nightmare – When product configuration becomes so highly customized, it limits the number of service reps who have the competency to work on the equipment. This results in long service times. Worse yet is when service reps turn over, new reps, which lack the knowledge of the original configuration, begin applying short term service “band-aids” that sacrifice product performance. In addition, complex product configurations bring complex service agreements. As is the case for orders, service contracts become incredibly difficult to administer and manage. For example, one customer of an equipment manufacturer demanded that each component of the product have its’ own unique service agreement…all 200 parts. Remarketing vs. Marketing – Marketing gets the opportunity to host the party. Because demand for most products already exists, marketers focus their efforts on having fun catering to big customers and satisfying the whims of the sales organization (big expensive customer events, sponsorships of sporting events, etc.). Their activities are nothing more than “remarketing” to existing customers to keep the party going. As the downturn comes, marketing is stuck with pre-conditioned customers and reps who are looking for “fun” and “fluff”. Unfortunately in this environment, marketing never develops the types of programs and core competencies needed to effectively sell products and acquire new customers right when the company needs it the most. Map out a plan – you didn’t get into this overnight and you’re not getting out quickly. Start small and stay focused. Find/Create opportunities to standardize and/or simplify– force events such as technology implementation or new product introduction to standardize process, price and services. Understand that not everyone is going to make it – the hiring profile for reps and managers 10 to 20 years ago when the sales force was built may not make it – order takers vs. order makers. The service and marketing departments may also need retooling. New competencies, skill sets and training are also necessary for those who make it. Utilize new sales and marketing channels and retrain existing channels – introduce and pilot new sales and marketing channels that increase customer coverage, reduce overall sales cost, and improve customer acquisition. Help field sales reps find their “sweet spot” (closing large complex orders in new accounts) by providing training on multi-channel coverage models. Draw a line with customers – Analyze and determine the profitability of your customer base. Segment it into three groups: 1) Profitable, 2) Marginal but with Potential, 3) Unprofitable with no potential. Begin the process of re-conditioning the way customers in segment #2 buy. You’ve created the monster and now you have to tame it. In segment #3, begin the process of terminating the relationship. In the end, it is like any hangover. You feel terrible, you have a few (or a lot) of regrets, you promise to yourself and others that you’ll never do it again — but…it was fun while it lasted. Over the last 25 years, I’ve had the opportunity to work with well over 100 companies. Some of them recognized as “best in class” while others brought up the rear…so to speak. What has been interesting is the consistent themes, trends, and/or characteristics that determine where they land on that list. Below are what I’ve observed to be the “Top 10 Truisms” of business behavior. Corporate Culture – is directly related to the CEO. He or she sets the tone that everyone else emulates. Trust – is the difference between a dysfunctional and a high performance team. If you can not trust the people you work with and/or who work for you, you can not perform at the highest level. 80/20 Rule – the Pareto Principal always, ALWAYS applies, whether it is revenue, profit, sales, people, etc. No New Customers – if you are an established company that has been in business for 10 years or more, you can achieve revenue and profit objectives solely based on doing a better job of capturing the opportunity in existing accounts (see the 80/20 rule). Marketing Contribution – 10-15% of Revenues– if you are in a mature marketplace and you have to use marketing to acquire new customers, sell new products, etc., know that it will not product more than 10-15% of your total revenues. The other 85-90% will come from the sales channels. The Rule of 70% – given the speed of today’s market, competitors, and customers, getting a product and/or marketing campaign/program 70% complete and out the door is good “enough.” Let customers/prospects complete the rest of the 30% for you. Less internal debate and more customer feedback makes for successful programs and products. NEW does not mean BETTER – everyone loves something new but it is the last thing that any company should focus on. Building/ selling/thinking NEW takes too long, cost too much and will have the lowest ROI. Focus first on getting more out of existing…and then invest in new (see 80/20 rule..again). Elephant in the Room syndrome – there are big problems impacting performance in every organization that everyone knows about but no one talks about or attempts to fix. They will treat the symptoms but not the core problem…call it career preservation. High performing companies (and leaders) create a culture that is open to addressing difficult issues. Risk Tolerance – fast growing and “best in class” companies have a culture of tolerating risk and/or failure. It is a HIGHLY valuable and a very real competitive advantage. Performance Dashboards – we recently completed a research study with the CMO Council that surveyed over 400 CMO’s in companies over $500 Million in revenue. 50% of the responders said that they have a Dashboard and 38% said that they were working on one. Here’s the truth…they don’t have a dashboard; they have an excel based “Report Card” of what they did, where they spent marketing dollars and what they got in return (hopefully). The reality is that a real Dashboard has real time information and can allow you to forecast at least 30 days forward. Don’t show everyone in the organization your “numbers” until you know how to move them in the right direction. Sales Force Behavior – is consistent regardless of what they are selling, who they are selling it to, or the industry they work in. As a result, it’s somewhat easy to predict how they will react in certain situations and/or to certain changes or challenges. Good insight for marketers to know. Smart companies can’t tell you what they do – professional services firms are terrible at creating the “elevator” speech. The reason is that they view the company as a reflection of the work they do with clients. Each client and project being different, they form different opinions as to the organization’s value. Please add your “Truism” in the comment section below.